On August 29, 2005, Hurricane Katrina devastated the southeastern part of Louisiana and the population of the Lafayette community grew with evacuees. With the growth, the needs of the community changed and the Lafayette 4-H Junior Leaders were key in addressing the needs. When the junior leaders regrouped after their dismantled retreat and Hurricane Katrina, they began to discuss the needs of the evacuee population. The community housed many shelters. Even though the junior leaders weren’t the required age for shelter volunteers, they discovered other ways to aid in the effort. After hearing a guest speaker from The Family Tree counseling service, the junior leaders partnered to assemble and distribute 5,000 Hurricane HERO Courageous Kids packets. On September 20, evacuation orders for the Lafayette area were issued as another storm entered the Gulf. Once again, the Lafayette community was impacted, but this time the devastation would be much closer to home. When the junior leader group was reassembled, the youth and adults involved once again began the needs-assessment process involving group discussion and reviewing of printed media materials. The needs identified ranged from environmental literacy to personal needs created by Hurricane Rita. To come to consensus, each issue was researched, and youth gave peer presentations to justify addressing the need. After each needs presentation, club members had dialogue on the issue, and then a vote was taken. The issue decided on was disaster recovery needs of youth. As the group reflected on the various needs and their capabilities to address the needs, they concluded one of the best means to address the needs was through what they knew best, 4-H. The group targeted the Cameron Parish community with a concentrated focus on their peers and providing them support in their 4-H work. The objectives identified were to develop empathy for youth displaced as a result of a hurricane, practice decision-making skills, and identify feelings and actions encountered by children after a disaster. Once the need was decided on, the planning by youth and adults began. A needs assessment was conducted to identify and prioritize the needs that the youth could best serve in rebuilding. The goal set by the youth was to establish a network with 4-H members in Cameron Parish directly impacted by Hurricane Rita. The first function planned was to begin developing caring relationships and a better awareness of the needs. An initial visit to the parish included a tour of the devastated area conducted by Cameron Parish sheriff and school board officials. As members participated in the tour they were introduced to the stages of grief, listened to personal testimonials and asked questions exploring their feelings based on being present in a disaster. Members had to undergo medical requirements prior to the trip, which was an important component of the orientation process. Members had an opportunity to hear about the devastation and received an update on the progress being made and future plans to continue the clean up efforts. Youth toured the downtown area of Cameron on foot. Participants indicated through reflection that they have a better understanding of the stages of grief in relation to experiencing a disaster. Upon the return home, the Lafayette group formulated a plan to address the needs they saw and heard. Initially, the Lafayette members assembled packets on managing stress in times of crisis for the students and their families. These packets were distributed to all students in the Cameron Parish school system. The second effort targeted the livestock project. Lafayette 4-H members learned of the large percentage of Cameron youth involved in the project as well as the divesting impact on that sector of the parish. Livestock and horse equipment drives were conducted during the parish and district livestock and horse shows. These supplies were distributed to Cameron Parish exhibitors at the LSU AgCenter state shows. Given that many of the Cameron Parish 4-H events and activities were cancelled, the Lafayette group extended an invitation to Cameron members to participate in Lafayette 4-H events. KLFY-TV 10 featured the effort during their weekly teen report that highlighted the project. Realizing that many families couldn’t afford to participate in routine 4-H events such as 4-H camp and 4-H U, the Lafayette group developed the “Coins for Cameron” drive throughout the parish that raised $4,500. These funds were used to offset expenses for the Cameron members that participate in state 4-H events such as 4-H Camp and 4-H U. Throughout the year, the Lafayette Parish youth continued to learn about natural disaster issues through educational tours and guest speakers. One of the most interesting experiences was a tour of the KLFY-TV 10 television station and weather laboratory. The tour featured various career opportunities, educational requirements and discussion about the 2006 hurricane season. Members participated in Hurricane Rita Anniversary Celebration sponsored by the Americas Wetlands Campaign. The celebration provided another opportunity for the members to visit the parish, and they were able to witness the progress made. The youth also had an opportunity to visit their friends and receive well-deserved recognition of their efforts at a ceremony attended by Governor Kathleen Blanco, Lt. Gov. Mitch Landrieu, U.S. Senators Mary Landrieu, D-New Orleans, and David Vitter, R-Metairie, Lake Charles Mayor Randy Roach, White House hurricane recovery coordinator Don Powell and Army three-star Gen. Russell Honoré, who commanded federal recovery troops. Youth reflected periodically throughout the project using various methods. Reflection focused on learning experienced related to disasters, individual growth and their role in society. Throughout the process, students shared their experiences in group settings, interviews and personal journals. In an effort to capture the outcomes of the service-learning effort, the parish participated in the online evaluation offered by the state 4-H department. Through the online evaluation instrument as well as through the different reflection exercises, many outcomes were achieved. Youth members and adult volunteers have become more aware of the community issues and were able to jointly develop and demonstrate leadership and communication skills in plans addressing needs. As a parish 4-H program, youth in the junior leader role have been more engaged and have increased participation. The group is still committed to the effort and has expanded to environmental educational outreach and direct environmental projects. 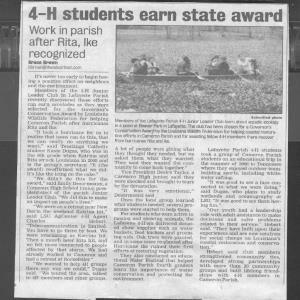 The group was instrumental in the establishment of a Water Festival that targeted all fourth-grade students in Cameron Parish.The effort was collaborative with many other groups such as USDA-NRCS Imperial Calcasieu Resource Conservation & Development Council, Soil and Water Conversation District (SWCD), American Wetlands Conservation Corps (AWCC) members, Calcasieu Parish 4-H Junior Leaders, Cameron Sheriff’s Department, Cameron Parish School Board and Cameron Parish Police Jury. The Water Festival consisted of multiple, structured learning stations where students actively engage in hands-on water activities and investigations. Station topics include the hydrologic cycle, water quality, wetlands, water management, water conservation, watersheds and more. The educational activities from the Make a Splash with Project WET Water Festivals are designed to emphasize water education principles within a fun, interactive environment. Project WET Water Festivals provide a solid educational framework for teachers and students. Students built beach fences to help establish sand dunes. Participants planted grass in the Holly Beach area. The Lafayette 4-H Junior Leader group also participated in the Acorns of Hope project sponsored by Bob Thibodeaux. The group traveled to Cameron Parish and planted acorns in an effort to reestablish the tree population of the coastline. Given the 2008 storms, the group continues to target this effort by working with Acorns of Hope effort, the Water Festival and working with the AmeriCorps effort with American Wetland Conservation Corps. The group has also expanded their environmental work in the Lafayette committee by addressing local community needs and education. This year’s efforts include building bat boxes to address the mosquito problems and Go Green Grocery Shopping Day in which they would educate the public of the environmental impact of plastic bags. Overall, this effort has increased the networking of community agencies (KLFY-TV10, United Way of Acadiana, Cameron Parish Police Jury, Cameron Parish Sheriff’s Department, Cameron Parish School Board, Cameron Parish 4-H Junior Leaders, Cameron Parish 4-H members, Vernon Parish 4-H Junior Leaders, The Family Tree, Louisiana Department of Wildlife & Fisheries, Lafayette Parish 4-H Clubs, Americas Wetland Campaign, American Wetlands Conservation Corps, USDA-NRCS, Imperial Calcasieu Resource Conservation & Development Council, Soil and Water Conservation District, Lafayette Parish School System, Lafayette Parish 4-H livestock exhibitors and parents. Beyond the educational impact, youth contributed a monthly average of 395 hours or 16 days. According to The Independent Sector, the value of volunteer service in Louisiana is $16.95 which yields an economic value of $6,695.25 monthly. Their efforts also raised $4,500.00 through donations and in-kind. Donations were solicited through local media, personal contacts and newsletters from local businesses, private individuals and clubs in the parish.